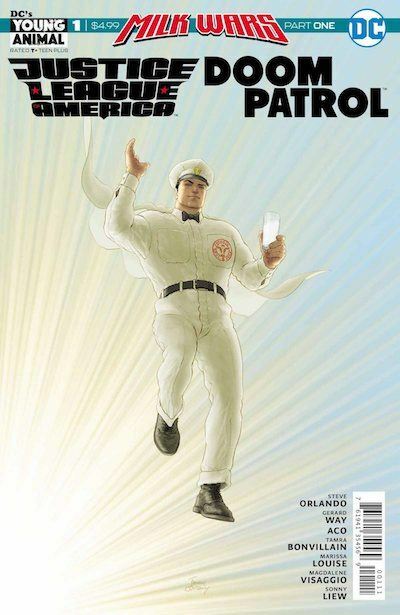 Justice League of America/Doom Patrol Special #1, the debut issue for the Milk Wars crossover, is the exact kind of media I would have loved to see pitched. It’s that special kind bonkers that works in spite of itself and must have elicited plenty of eyebrow raises at that initial meeting. Mind you, this would also be a board that purposefully invites Grant Morrison to its biggest meetings, so they may be used to this sort of thing. Especially since this Milk Wars reads like a Morrison comic. JLA/Doom Patrol Special #1 cover by Frank Quitely. Writer Gerard Way (with help from Steve Orlando) worships at the altar of Morrison here more than almost anywhere I have ever read. The Frank Quitely covers are the first dead giveaway, the “corporation that’s basically postmodernism” is the second. But this isn’t necessarily a bad thing. For all the accusations that Morrison’s work is dense and unreadable, it’s never unclear on its themes. Here, too, the same principle applies: the issue is packed and weird and just on this side of a hot mess but it’s message rings strong. It may be difficult to walk away and fully get what just happened to you, but you understand the themes far more than you may expect. And such heavy-handed borrowing of style adds newer layers of irony to the crossover’s central premise. That premise is essentially the homogenization of media and characters and the deployment of heroes as corporate mouthpieces. It’s a problem comics experienced long before Superman lifted that car above his head in his debut, one only compounded by the ownership and licensing of superheroes by the largest media conglomerates on the planet. Of course, there’s an irony about Young Animal itself making this comic. A line of old, weird comics that danced between DC and Vertigo, now playing under the direct watch of DC Comics proper (a division of Warner Bros. Entertainment, a Time Warner company). That said, it’s fantastic seeing his sensibilities, along with the old, weird Vertigo/DC, played out in this next generation of comics and creators. Granted, that’s been Young Animal’s appeal since the get-go. It’s Vertigo but with more rainbow colouring, a callback to Vertigo’s glory days, minus the obsession with sadomasochism and whatever Preacher dreamed up that month. Milk Wars is a callback but also an attempt forward, but the JLA half of this crossover has further to go than the Doom Patrol. 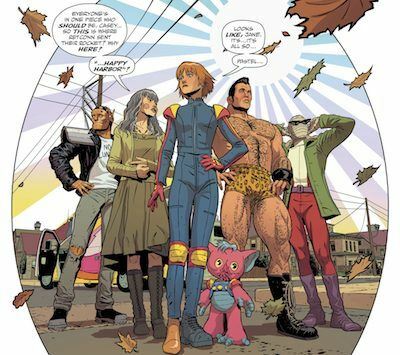 Things are comfortably weird here and, while there are some interesting, even tender moments across team members, Milk Wars is Doom Patrol’s territory. The JLA (necessarily short their most recognizable characters) are passing through. Beautiful interiors by Aco hit the sweet spot of Vertigo nostalgia and contemporary DC style. In fact, the issue reads like a dense-but-standard crossover first issue, essentially telling the story of two groups meeting, fighting for a bit, then realizing there’s a bigger threat. Of course, no other crossover uses sentences like the above, or has Flex Mentallo. It’s the perfect blend that illustrator Aco pulls off effortlessly with a huge help from colourists Tamra Bonvillain & Marissa Louise. The art feels like a callback to a non-existent Vertigo style brought into today with contemporary colouring. Bright, deep, fantastic colours pop off the page, especially as the book gets more surreal. It’s an experience simply to look at, even if the text-heavy pages interfere with the more surreal and abstract points being made. Overall, Milk Wars is the exact sort of lunacy that comes through DC only rarely and almost always from Morrison. Here, in a new generation of creators, the pop flavourings make for a dense but enjoyable read, one that is sure to be a heck of a ride as Milk Wars continues. tl;dr review: A Morrison send up that’s bright, fun, dense and more on-the-nose than it purports to be.